Authors: Ilene S. Schwartz Ph.D., BCBA-D, Julie Ashmun M.Ed., BCBA, Bonnie McBride Ph.D., BCBA-D, Crista Scott M.Ed., BCBA, Susan R. Sandall Ph.D. Available in packs of 5, these forms are used to assess children's functional needs with the DATA Model, a comprehensive, school-based program for children 3 to 5 with autism. Blending best practices from applied behavior analysis and early childhood special education, the DATA Model is a proven program rooted in evidence-based practice and based on 20 years of testing and refinement. A must for autism and behavior specialists, SLPs, program directors, and early childhood special educators, the DATA Model is the all-in-one program you need to prepare young children with autism for long-term success at school and in their community. Learn more about The DATA Model here. "The Data Model, which is built upon the scientific principles of applied behavior analysis, provides a comprehensive early childhood curriculum that allows instruction to be tailored to the unique needs of the child with autism spectrum disorder (ASD). There is no doubt that this tool will be of great use to any early childhood practitioner, or family member, working with young children with ASD." "The DATA Model Manual and Skills Checklist provide a wealth of information beneficial for a variety of professionals who work with young children with autism, from those who have little experience to those who have been working in the field for many years. The rich information and valuable resources are well organized and will enhance the libraries of those who work with preschoolers with ASD." "I am thrilled that this tool is available. The Data Model provides all the information and tools necessary for supporting young children with Autism in early childhood environments. 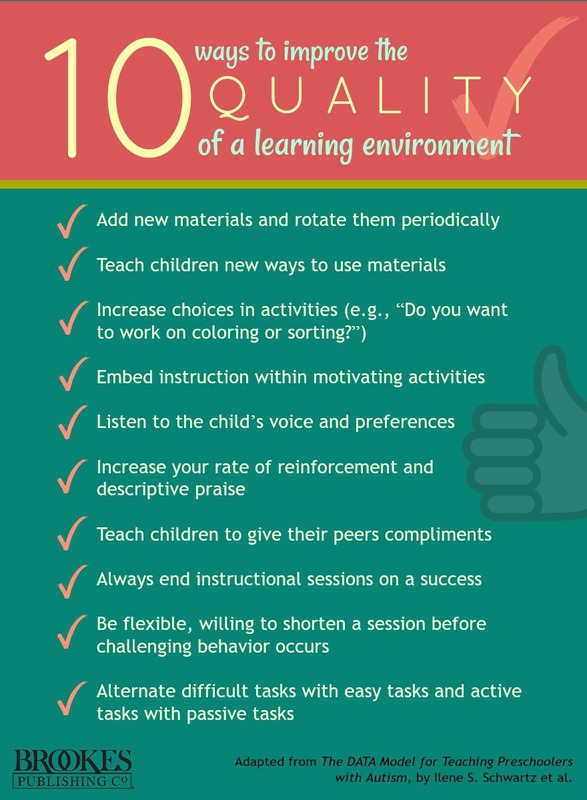 The authors have created a process and the tools necessary for delivering high quality instruction on highly valued skills in the context of developmentally appropriate learning environments." "I found the Skills Checklist to be particularly useful and would like to start using it immediately in my coursework and professional development activities." "The DATA Model offers expert and important advice while also providing easy-to-use methods for developing and teaching a myriad of important and critical target behaviors for preschoolers." "The DATA Model for Teaching Preschoolers with Autism includes a thoughtful and complete manual encompassing the best evidence-based practices for providing a high quality inclusive program for young children with ASD. It covers the essential pieces that a team would need to know to implement a developmentally appropriate, inclusive, and specialized program for young children with ASD in their school or community. The included Skills Checklist is comprehensive and detailed and would provide teams with ongoing information about support a child would need to be successful in an inclusive preschool setting." "This is the best manual I have ever seen for determining what and how to teach young children with autism. The DATA Model and the Skills Checklist are incredibly valuable resources, and the emphasis on quality of life results in a perfectly-oriented curriculum." "With the use of the DATA Model, young children with ASD are able to fully benefit from the various learning opportunities that inclusive preschool classrooms provide. The model provides practitioners with a framework for embedding intensive interventions within everyday routines and activities in inclusive preschool classrooms to meet their unique learning needs in natural contexts, promoting meaningful learning outcomes that are generalized and maintained across home, school, and community contexts."